I'm getting close to the last short row shaping section then I'm off to setting the sleeves aside on my sweater. Honestly, this has been my main knitting project the past week. I haven't had much brain space for much else. I wish I could put my finger on exactly what is taking up all of my time. I'm happy and feel good so I'm not going to get too caught up on the whys. The knitting is there waiting for me. 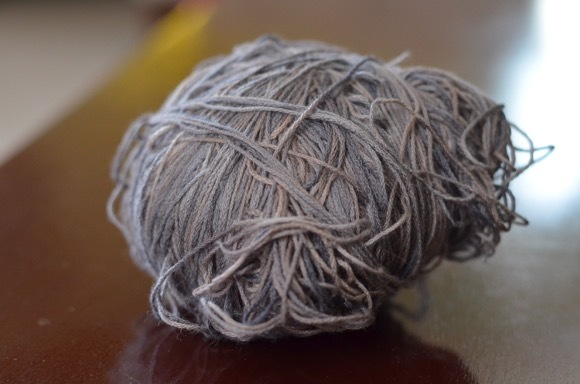 How do you like the condition of that skein of yarn? As you probably have guessed, this is a skein that Holly got ahold of and went wild with the tossing and turning. Even though she loves yarn she rarely eats it or break it up into pieces, usually I find a knotty mess for me to untangle. Anyways, this skein was a previous knitting project that failed miserably so I ripped it out, balled it up and set it aside for another day. 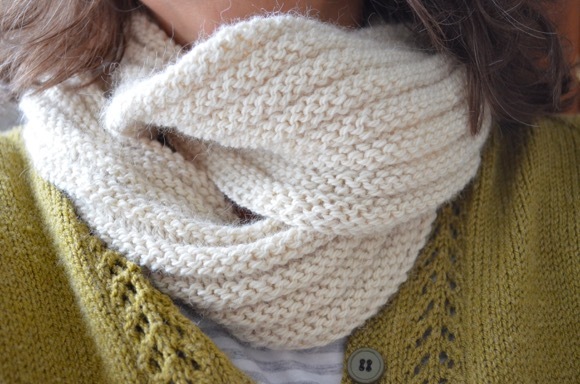 Today I was thinking about this skein and so I'll be mulling over what exactly I want to make. The noro socks have been woefully neglected these past few weeks. I take this project to babysitting and lately knitting time at work has been scarce. 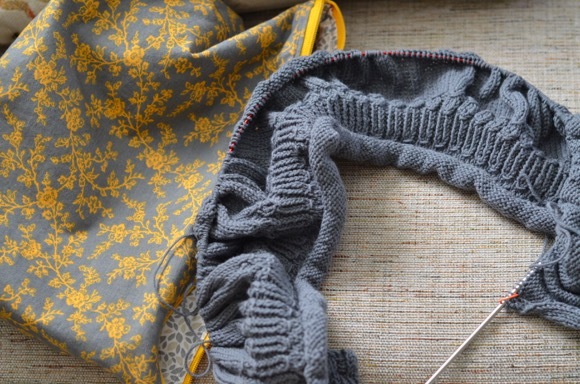 What are you knitting and crafting these days? My kitties go after my yarn any chance the get. Usually they race around the house stringing as far as it will go. My family thinks it’s hysterical. They don’t have to untangle it. It is rather funny. I’d love to have a video of their antics. That cardigan will be lovely! But, I just love those socks and their muted colors! 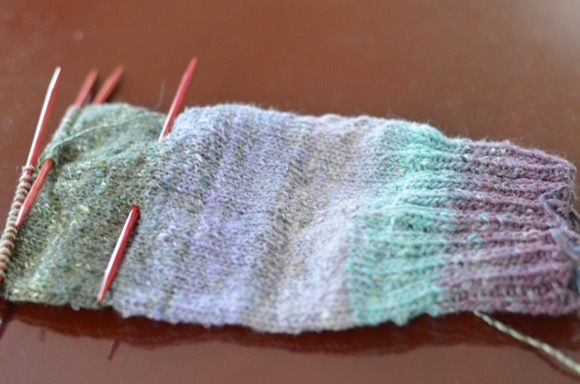 I love the color wave in the noro socks! Cats and Yarn. Not always easy to separate. Tyg likes to get up on the table and try to bite whatever yarn I am working with - it's a pain. 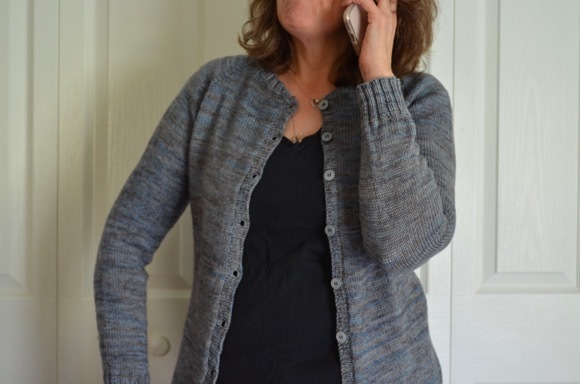 Your cardigan is zipping along, and those socks are such a great shout of Spring color!! You never realize how OCD you are about certain things until you see a messy skein of yarn and cringe. I really am laughing at how uncomfortable that skein is making me. It's literally making my skin crawl. I'm sitting here surrounded by the disaster zone I call a desk, not at all bothered by the mess and yet that skein of yarn.... Good grief! Knit faster please! I need to see either the neat inside of the skein or the next skein. Plus, I want to see how your sweater progresses. It looks lovely. Naughty Holly, LOL. That's what's going to happen when these dames of mine find their kittens one day. The Loops & Thread Joy DK I used for the booties came in balls but the yarn was messy in the wired bins at Michael's. I know from experience that even in this form the yarn can get tangled up so I brought out my ball winder and rewound them. The colour combination of the socks are a real delight, beautiful. I have so many projects on the go at the moment it doesn't seem as if I am progressing on any. i love variegated yarn... i love to watch as they knit out. i was busy on my daisy chain sock test knit for fox and folk and my wee one decided to rip it all away... so i will have to start again and this time keep it up and away from little paws.